We have been pleased to count NAZCA among our partners for the Suntrip 2018. Since my fist solar recumbent, i use Nazca Sport seats and and I am wholly satisfied with it. This seat also contributed in equal measure to ensure my victory on The Suntrip 2015 with my solar recumbent ‘Dragonfly ». 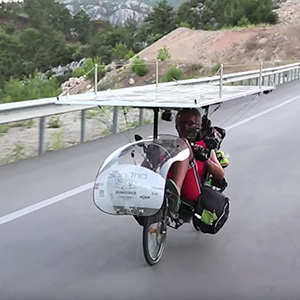 From the start in 1998 Nazca Ligfietsen aim to design and build the best recumbent bike or recumbent tandem for a wide variety of users, with varying demands and wishes. The emphasis is on touring and travelling. All Nazca bikes are hand-built in the Netherlands according to customer’s specifications, so each Nazca recumbent is a unique specimen. The owners Henk van der Woerdt and Monique Holterman very much strive for a personal approach towards their customers, many of whom they have welcomed in their showroom in Nijeveen, The Netherlands. Nazca recumbent bikes and tandems have found their way to satisfied cyclists in many countries, and can be seen riding all over the world!